Please see our Pen Making Tools category for more choices. The Apprentice Pen Center eliminates pen mandrel bowing and off-axis blanks that result from over-tightening the tailstock. The Precision Machine™ Pen Center applies pressure directly to the bushings and headstock allowing you to achieve a more accurate and superior result while pen turning. Comments On Jan 23, 2017:I have used live pen centers from other sites and found that they do not hold the mandrel tightly enough. The slop in these other live centers results in oval turned blanks. 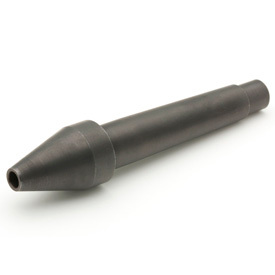 The Precision Machine Pen Center holds the mandrel true and this results in circular turned blanks right off the tool. With these results I begin sanding with fine sandpaper for a quicker finish. Comments On Apr 24, 2016:This is the best live center out there for pen turning. Takes the stress off the mandrel so it doesn't bow, and firmly slides against the end bushing to keep your barrels spinning instead of catching/stalling. If you make pens even just for a hobby, this is one of the best purchases you'll make. Comments On Apr 01, 2015:I replaced the 60 degree live center I was using with this, and it worked amazing! There is no way to bend the mandrel using this center! It simply presses the blanks and any bushings you may use together and holds them solidly. With the previous center I was using, I used to have to pile up the bushings to fill the remainder of the mandrel, so I would hold securely, and then hope the threaded nut on the end wouldn't loosen while I work - it did that regularly. Now I don't even use the threaded nut on the end of the mandrel!! The Precision Machine Pen Center holds it securely, with no risk of bending the mandrel!! I would recommend this to anyone who turns pen blanks!! Comments On Oct 23, 2013:The Precision Machine Pen Center is an excellent alternative to a live center. The pen center is easy to engage and keeps my work in place without putting pressure on the mandrel that causes it to bend. I would classify this Center as a "must have" accessory for a pen turner. Comments On Jan 20, 2013:I heard about these and finally decided to take a look at them..Initial thought was "WOW 40.00"..Looked around and found some cheaper but went with this center..Glad I did,its a good quality pen center that is dead quiet and works like a charm..It saves a lot of time looking for spacers and putting the knurled nut on the mandrel.. Totally glad I bought this..Highly recommend for any pen maker out there that wants to keep their mandrel straight and save time with setup..
A product that works, quality at its best. Comments On Oct 10, 2012:I have turned over 30 pens with it, and it works great, fast changing, and quiet. I have seen one on another site at half the price, but after reading the reviews on there's I knew it was not the one I wanted, you get what you pay for, this was every bit worth the extra money. You will not regret buying this one. Comments On Sep 26, 2012:My lathe is a little older and tired, probably needs an overhaul but with this new center I can turn pens and small items on the mandrel and they turn true--not off center. Changing blanks is now quicker so my production rate has increased too. This center was a good investment for my shop...... I have never been disappointed with anything I bought from Craft Supplies USA. Quick delivery, great customer service, quality products at a fair price.